The modern violin has been around for roughly 500 years. It was said to have been designed in the 1500’s by Andrea Amati. Playing the violin burns approximately 170 calories per hour. Forget about your workout and start practicing harder! 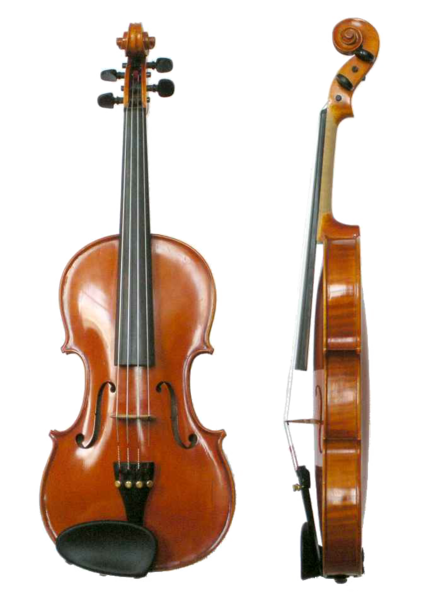 Violins are typically comprised of spruce or maple wood. Violins come in many different sizes. Typically, students will start learning violin at a young age with a 1/32 or 1/16 size violin. As the student ages they will graduate up to a full sized violin. Violins are very complex. Over 70 different pieces of wood are put together to form the modern violin. The world record in cycling backwards playing a violin is 60.45 kilometres in 5 hours 8 seconds. The most expensive violin in the world was made by Giuseppe Guarneri in 1741. This extravagant violin was appraised with a value of $18 million. Violin bows typically contain 150 to 200 hairs. They can be made up of a variety of materials including nylon and horse hair. Violin strings were first made of sheep gut (commonly known as catgut), which was stretched, dried, and twisted. Other materials violin strings have been made out of include: solid steel, stranded steel, or various synthetic materials, wound with various metals, and sometimes plated with silver. Looking for violin sheet music? Visit our website at www.sheetmusicplus.com. Brendan Lai-Tong holds degrees in trombone performance from University of Miami and the San Francisco Conservatory of Music. Great to hear your daughter is learning an instrument! Our best recommendation is to take her into whichever store you’ll be renting from and have her get measured. It really depends on her size.